Who doesn’t create content? The challenge is knowing which assets are actually worth offering to prospects and customers. Far beyond simply providing links to downloadable product data sheets, content marketing is the art of creating, curating, and distributing valuable, business-relevant information; all with the goal of helping buyers make the most informed decisions (while forming unbreakable loyalties to you). This definitive guide shows you how to tap the wild success of B2C content marketing in your B2B world. Brought to you by the Modern Marketing experts, Oracle Eloqua. 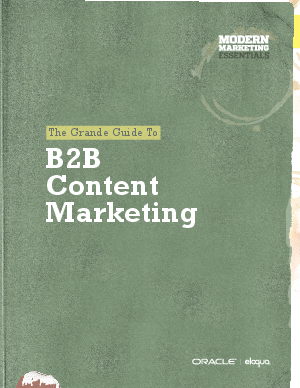 Read the “Grande Guide to B2B Content Marketing” now.